We've got a pretty interesting story for you today, regarding upcoming zombie slaying sequel Left 4 Dead 2. You'll recall that many people were understandably upset at the announcement of L4D2, coming so soon after the first game, and before any DLC had even been announced. An internet petition and boycott ensued. 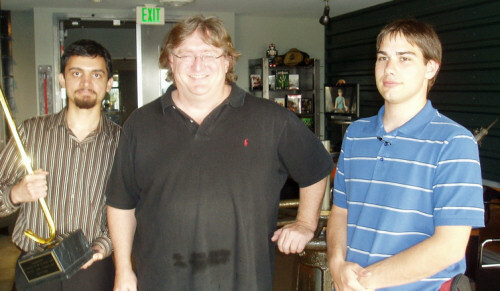 Valve decided to fly the two most vocal boycotters out to check things out and hopefully smooth things over. (I guess internet petitions do work after all!) Interested in what these two have to say after the visit? We got a chance to take a look at L4D2 (including the version that was shown at PAX) as well as ask questions to the L4D/L4D2 team. The good news: 4v4 matchmaking is supposed to drop before the release of Left 4 Dead 2. We have also been told by one of the fellows there that Crash Course is NOT supposed to be dropping this Thursday, but will be dropping 'soon'. We can't get into details, but we can definitely say that support for L4D is NOT being dropped by Valve and that they are actively pursuing bug fixes for Left 4 Dead. We're going to continue to talk to Valve and ask questions as needed, however if the frantic pace which we had seen people working at is any indication, we're not going to be left in the dust. The staff seemed to honestly love the original 4 Survivors and many said that “we're not done with them yet”. As for L4D2, things seemed balanced and 'tight' and did not feel like a rushed job. While we were visiting their offices we personally witnessed what can only be called a small army of artists, coders, mappers hard at work, which explains the rapid transformations in artwork that we've all seen. What we can say with confidence is that the quality of gameplay in Left 4 Dead 2 is not in question; and it will only get better (from what we understand, almost daily testing of game builds by most of the staff at Valve). Additionally, the boycotters revealed that more DLC is coming for the first Left 4 Dead, even past "Crash Course". That's very good news for zombie fans either way. After reading this, it occurred to me that Valve seems to be supporting both versions of Left 4 Dead adequately in the future. It's almost like games that come in two versions, most notably Pokemon. You can play either game and have a great experience, but for all it has to offer, you'll want both. We definitely fall into this latter category, and will play both games as long as the keep being supported!